Sir Donald Bradman casts a long shadow over his contemporaries and predecessors from which it seems, in the 21st Century, only Victor Trumper manages to emerge. The likes of Clem Hill, Warren Bardsley, and Charles Macartney from the pre-Bradman era are largely forgotten. Of those who played with Bradman one would have thought, irrespective of the merits of the innings concerned, that the huge scores amassed by Bill Ponsford would have guaranteed his continuing recognition but the truth is that like Bill Woodfull, and later Lindsay Hassett and Neil Harvey, his reputation is simply dwarfed by that of Bradman. To the list of batsmen whose memories deserve to be more revered than they are could also be added Bill Brown, Arthur Morris, Sid Barnes and Jack Ryder but to me the greatest injustice of the “Bradman effect” is that the name of Stan McCabe does not crop up when the giants of the game are discussed. Yorkshiremen are not given to hyperbole and Sir Leonard Hutton was no exception to that rule. His assessment of McCabe was “It would be hard to think of a greater Australian batsman. He had qualities that even Bradman hadn’t got.” Although not a Yorkshireman that great English bowler of the earliest years of the 20th century, Sydney Barnes, a man whose belief in his own ability was absolute and who seldom spoke at all unless it suited him to do so, was moved to say of McCabe, in conversation with Neville Cardus at Trent Bridge in 1938, “I don’t think I could have kept him quiet”. The inevitable first question to be asked is what prompted such fulsome praise in respect of a man whose Test average over 39 matches was just a shade over 48 with a First Class average just one point higher. Those are respectable figures by any standards but, taking into account prevailing conditions, nothing out of the ordinary. What separates McCabe from his peers are what will always rank as three of the finest innings ever played in International cricket and they are cornerstone of my argument. 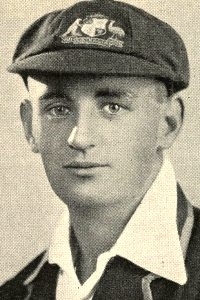 In December 1932 Stan McCabe was just 22 but a comparative veteran of 15 Test caps. His average at this time was just 33 and his place must have been under some pressure. He had played five Tests in England in 1930 and then home series against West Indies and South Africa all three contests having been won by an increasingly dominant Australia. McCabe’s highest Test score to date, 90, had been recorded in circumstances that gave a taste of what was to come. In the inaugural Test against West Indies when McCabe went out to bat the home side were rocking at 64-3 with Bradman already dismissed and a useful looking score of 296 on the board for the visitors. In the end Australia won the game comfortably but without McCabe’s innings and his fourth wicket stand of 182 with Alan Kippax that match may have turned out very differently. The 1932/33 “Bodyline” series is an enduring piece of cricket history so much so that the series and its main protagonists, Douglas Jardine, Harold Larwood and Bradman, remain a source of fascination to lovers of the game more than 75 years on. In the first Test of the series, at Sydney, Australia batted first and McCabe came to the crease with Australia, without Bradman in the side, precariously placed at 82-3. A few balls later the fourth wicket fell as Larwood produced a spell of 3 for 7. For what was to prove the only time in the series McCabe, having asked his father not to allow his mother to jump the fence if he was struck, went for the leg theory bowling head on in a pulsating innings. He found support initially from Vic Richardson, grandfather of the Chappell brothers, and this pair added 129 before Richardson succumbed to Voce’s Bodyline. Oldfield followed soon after but in Clarrie Grimmett McCabe found a staunch ally and by the close McCabe had taken his score to 127*. On the second morning a refreshed Larwood and Voce ripped out Grimmett, Lisle Nagel and Tiger O’Reilly with just 15 more runs added leaving McCabe with just Tim Wall for company. Despite the ferocity of the bowling McCabe marshalled the strike so well that the tenth wicket added 55 of which Wall had scored just 4 before McCabe for once failed to keep the strike and Wally Hammond was able to tease a chance out of the number eleven which Gubby Allen at short leg gratefully accepted. The statistics of McCabe’s innings illustrate just what “Bodyline” involved and, given that only Voce and Larwood were bowling it, the extent to which McCabe went after it. Of his 187 as many as 105 were scored from the Notts pair. Just 18 of his runs came in front of square on the offside and 19 of his 25 boundaries went to the leg side fence with 13 of them from full blooded hooks. In the near rout that was the Australian second innings McCabe got going again when, at 32, he was for once outfoxed by the wily Jardine who brought on Hammond to bowl to him and he was trapped LBW by a slower ball. Australia lost the match by ten wickets and the series 4-1. Subsequently a number of the England side confirmed that after McCabe’s sustained assault dropping the leg theory tactics altogether was seriously considered. For the remainder of the Bodyline series McCabe suffered with his teammates and it was only in the fifth and final Test with the series long gone that he recorded another half century in scoring 73 in the Australian first innings. What was not widely known at the time was that McCabe was affected by tonsilitis to a greater or lesser degree throughout the series and underwent an operation following the Tests. In those days before antibiotics such infections could often be, as here, difficult to shake off. It seems unrealistic to suggest that McCabe’s performances were not affected although in his self-effacing manner he never mentioned it. McCabe’s own verdict on his first great innings was “It was really an impulsive senseless innings…a gamble that should not have been made”, a view for which my research, unsurprisingly, has found no support whatsoever. In 1934 in England McCabe made important contributions when needed in the first and third Tests before in the fourth and fifth finding himself coming in after Bradman and Ponsford had added 388 and 451 respectively. McCabe was never adept at scoring cheap runs and contributed little after those partnerships but his series average of 60 was his best yet. A trip to South Africa followed for Australia in 1935/36. The tourists’ batting was experimental following the retirements of Woodfull, Ponsford and Kippax and Bradman’s unavailability. McCabe scored 149 in the first Test to set up a 9 wicket victory and the last three Tests were all won by an innings so the South Africans, despite their first ever series victory in England in 1935, did not trouble the Australians save in the second match of the series at Johannesburg when McCabe’s second great innings was played. There was no hint of the drama to come as the South Africans decided to bat after winning the toss only to be bundled out for 157. The Australians were doubtless disappointed to secure a lead of just 93 on first innings but when the hosts lost three wickets in clearing those arrears an Australian victory seemed inevitable. Only one South African was to reach the half century in their second innings but having done so Dudley Nourse went on to score 231 and with support all the way down the order South Africa were able to leave Australia a seemingly impossible target of 399 for victory in just over a day. In the final innings Bill Brown went early but as the South Africans attacked McCabe, batting at first drop, found plenty of gaps in the field and plundered 10 boundaries in a rapid 59 as the tourists reached 85-1 before accepting an offer of the light. McCabe, a smoker, was badly affected by the heat, the dust and the altitude and next morning told captain Vic Richardson that he did not think he would be able to bat. Legend has it that Richardson told him that if he felt unwell he should just deal in boundaries which advice, if indeed it was given, seems to have been taken seriously by McCabe. Today a side chasing another 314 for victory on the final day of a Test that was likely to be truncated by the weather, and which was being played on a deteriorating pitch, would play for a draw and indeed in the inter war period as well most would have followed that course. McCabe however did not play the game that way and by lunch he had become just the fourth batsman in Test history to add 100 to his score in a morning session. Australia took lunch at 217 for 2 with McCabe 159*. During the session the South Africans had realised that an improbable defeat was looming and had long since abandoned the attacking fields of the previous evening. As the interval progressed the clouds gathered and it became clear that a storm was in the offing but despite the poor light and the South Africans recalling their quick bowlers McCabe, now batting with another attacking batsman in left hander Len Darling, continued with his assault and refused all offers of the light. The chase finally came to an end with Australia just 125 short when the South African skipper, wicketkeeper Billy Wade, was successful in appealing against the light. In just under 200 minutes McCabe had scored 189* and were it not for the intervention of the weather Australia would surely have secured an improbable victory with some ease. Shortly after the players left the field the storm broke and washed away any chance of a resumption in minutes. As to the reason why Wade took the controversial step he did in circumstances where rain was inevitable has been the subject of some speculation the uncharitable suggesting he was desperate to avoid McCabe reaching 200 and stealing Nourse’s thunder. If that was his intention he was singularly unsuccessful as it is McCabe’s innings and not Nourse’s, nor indeed Grimmett’s magnificent bowling, that is remembered from the series. Australia’s next series was the exciting 1936/37 Ashes series in which England took a 2-0 lead before Australia came back to win the next three Tests to take the series. McCabe enjoyed a fine series recording his highest aggregate, 491, at more than 54 per innings his consistency being such that if the two innings where Australia were routed for 58 and 80 after being caught on rain affected wickets are disregarded he failed to record a half century just once in the series, that one occasion being in the context of an innings where, when he got to the crease, Australia were already 567 ahead and out of sight. None of McCabe’s innings in this series rank with his great efforts although had it not been for an umpiring error one may have. In the second Test at Sydney England, largely thanks to a not out double century from Walter Hammond, got to 426-6 before a storm broke. Although the Test was timeless it would have been foolish for England to press on following the resumption so Gubby Allen declared so that full use could be made of the wicket at its most spiteful and the Australians were duly dispatched for just 80 – it could have been worse as they were 31-7 before O’Reilly struck a few lusty blows at the end. Following on 346 behind Australia made a much better fist of their second innings with Fingleton and Bradman putting on 124 for the second wicket before they departed in quick succession leaving Australia on 186-3. McCabe, initially eschewing his usual ebullience, gradually began to assert himself and while he lost Alan Chipperfield and Jack Badcock at 220 and 226 he then found the ideal partner in young allrounder Morris Sievers and, with McCabe the dominant partner, this pair raised the score to within 28 of England’s total before disaster struck. Voce bowled a short delivery to McCabe who shaped to hook the ball to the fence. In the event the ball did not get up as McCabe expected but to his disbelief, and that of England skipper Gubby Allen who years later described the decision as “appalling”, Voce’s LBW appeal was answered in the affirmative. The talisman gone Sievers was run out straight away and the tail added just six more runs as England recorded an innings victory. Neville Cardus, covering an Ashes series in Australia for the only time, said of McCabe’s innings that it was “after a repressed prelude, cricket at its most skilful, courtly and chivalrous”. In that rollercoaster of a series a lead of anything significantly over 100 might well have been enough for victory – the situation was tailor made for McCabe and had his innings been allowed to follow its natural course he might well have delivered and given cricket history a fourth compelling reason to remember him. The final great innings of McCabe’s career came in 1938 at Trent Bridge, Nottingham. England were confident that the Ashes would change hands that year. They had a new captain in Hammond and in Denis Compton, Bill Edrich and Len Hutton had three young batsmen of a quality not seen for years. In Ken Farnes England had the best fast bowler on either side and in addition to the great Hedley Verity also had, in Doug Wright, a wrist spinner who it was felt might in time prove to be as good as O’Reilly. Australia on the other hand were felt to be vulnerable. Of the batsmen only Bradman and McCabe had proven track records and the bowling, after the omission of Grimmett, seemed far too reliant on O’Reilly. In the first Test England batted first and, with Hutton, Compton and Charles Barnett scoring single centuries and Eddie Paynter a double, posted a record 658 before Hammond declared with eight wickets down. When Australia batted McCabe came to the crease at 111-2 with Bradman gone and before the close he had lost Brown as well and Australia were perilously placed at 138-3 with two days left in the match. Next morning nightwatchman Frank Ward and Lindsay Hassett were soon dismissed and although Badcock and wicketkeeper Ben Barnett hung around for a while when Barnett was the seventh man dismissed and McCabe was joined by O’Reilly Australia were still 395 adrift. It was during what followed that Bradman summoned his entire team onto the pavilion balcony to “come and look at this, you’ll never see anything like it again”. The statistics paint a meaningful picture. By the time McCabe was finally dismissed for 232 he had scored more than 75% of the runs added whilst he was at the wicket. His latter 123 runs, which were scored in just 80 minutes, comprised as he farmed the strike 22 fours, 13 twos and just 9 singles. With last man Chuck Fleetwood-Smith he made 72 out of the 77 they added for the final wicket in just 35 minutes. Thanks to McCabe Australia reached the comparatively safe haven of 411 all out. It was not enough to avoid the follow on but the psychological tide had turned and the Australian batsmen applied themselves sufficiently in the second innings to save the game with ease. Inevitably much was said and written about McCabe’s 232. England captain Hammond said “…… he played one of the finest innings I have ever seen in my life”. His own captain, Bradman, went further “I would give a great deal to be able to play an innings like that. It was the greatest innings I ever saw or ever hope to see” but perhaps the most apposite comment is that of English journalist Denzil Batchelor who said “…he had come in at a moment in history when it seemed certain that the sun was about to set on a long period of Australian ascendancy. Stan McCabe, by his own efforts, had stopped the sun, and saved the Australian empire”. Was it luck? No one would claim that fielding standards were anything like as high in the 1930’s as they have since become and it might be argued that these innings could not be repeated for that reason alone. There is, of course, always an element of luck in any big innings but were there fielding blunders which allowed McCabe to record these scores? Contemporary reports refer to two chances at Sydney when it would seem that full blooded off side shots went to hand. The first was with McCabe’s score at 170 so, realistically, the innings already had its place in history. No first hand account I have read suggests either chance was straightforward and in Douglas Jardine’s account of the match they are not even mentioned. At Jo’burg the story is similar. McCabe was dropped twice, first on 166 when gully failed to cling on to a full blooded cut and then again at 186 when a slip catch was missed and the three runs which resulted took McCabe to his eventual 189* – the fielder’s inability to see the catch was the catalyst for Wade’s appeal against the light. Once again by the time two difficult chances went to hand the die had been cast. Only at Nottingham might a fieldsman have brought one of these innings to an early conclusion but that would have involved Edrich, fielding at short leg with McCabe on 123, clinging on to a full blooded pull which sounds to this writer, admittedly at more than 70 years distance, to be no real chance at all so the answer is no – luck played no significant part in Stan McCabe’s great innings. Did McCabe generally struggle to motivate himself is another question that is sometimes asked and is rather trickier to respond to. It certainly wouldn’t be fair to describe him as inconsistent as is illustrated by the fact that the Nottingham match was the seventh consecutive Test in which he had made at least one half century, but it is a reasonable observation that he does not seem to have scored heavily very often when others, and Bradman in particular, did. In short McCabe seems to have always produced of his best when his team were in difficulty. The examples already cited were in big matches. Two were in the first Test of an Ashes series then as now as big as it gets. The Jo’burg match was, in fairness, not as crucial but a South African victory might have caused the series to turn out very differently. It wasn’t however a case of the size of the occasion alone driving McCabe and in support of that I cite two other examples from much less important games. The first was the Sheffield Shield match between Queensland and New South Wales at the Gabba in November 1931. This game is famous because of the first over bowled by Queensland’s aboriginal fast bowler Eddie Gilbert. The first delivery accounted for Wendell Bill and the last removed Bradman, both caught behind and both without scoring. In between the two dismissals Bradman was dumped on his backside in his efforts to avoid one delivery and the force of another knocked the bat from his hand. Throughout his long life Bradman never wavered in his assertion that these were the fastest deliveries he had ever faced. By the time McCabe got to the crease at 31 Kippax had retired hurt and Alan Fairfax had been bowled by Gilbert. When Australia were all out for 432 McCabe was the last man standing, undefeated on 229. My second example comes from the 1938 tour. Prior to the first Test Australia went on their usual romp around the counties so much so that McCabe apart when they entered their match with Essex immediately prior to the first Test their least successful batsman, Bill Brown, was still averaging 56. McCabe, from whom in all the circumstances runs had not been needed, was averaging just 33. In a low scoring match Australia took a first innings lead of 31 but at 88-6 in their second innings there loomed the possibility of a rare defeat by a county. The England fast bowler Stan Nichols was in the middle of taking 6 for 25 from 18 hostile overs but McCabe, captain in Bradman’s absence, made a trademark half century in 75 minutes to take the game beyond Essex. Stan McCabe was not even 28 when he played the last of his great innings, in a series which was to be the last in which he played. His fitness was always suspect his entire career being plagued by problems with his feet caused by his having unusually high arches, and he was seemingly always the first to be afflicted by any infection that went near him. He was 36 when Test cricket eventually resumed after the war but unlike Bradman, who was two years his senior, there was to be no attempt to recapture former glories and his career remains, viewed objectively, one that was ended just as he should have been entering his best years. McCabe is not, of course, alone in failing to fulfil his potential due to matters beyond his control but surely, when what he did achieve is looked at dispassionately, this archetypal team man has earned the right to be regarded as one of cricket’s immortals? nice article. mccabe should have been on that list.